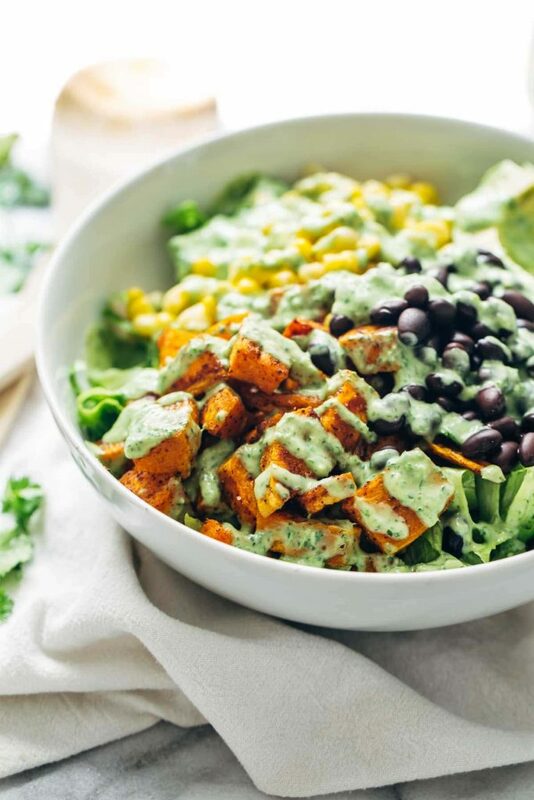 Today’s southwestern salad is so super simple and classic – just spicy golden roasted sweet potatoes tossed with sweet corn, black beans, chopped romaine lettuce, and a cool n’ creamy avocado dressing that is packed with cilantro, lime, and other good things. I mean, what can I say? 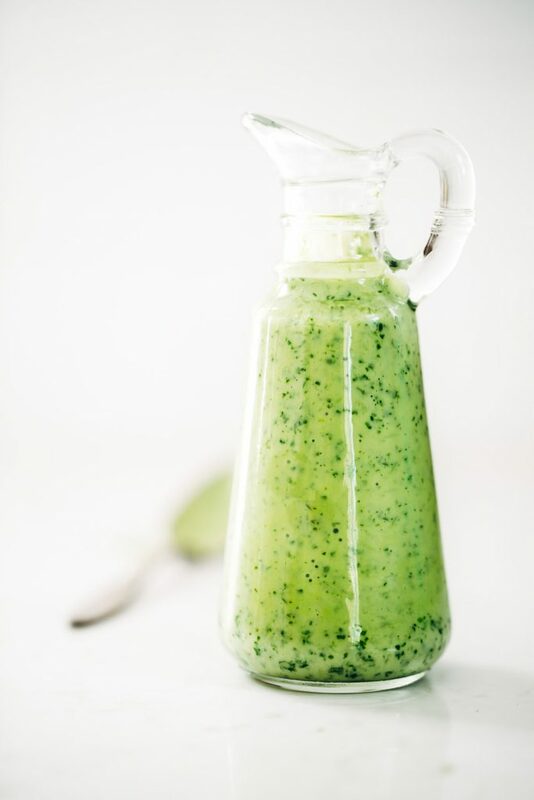 It’s not the world’s most cray-z-awesome creative combination – it’s just what my mouth wants to eat every day all day in the summatime. Let’s get right down to it. 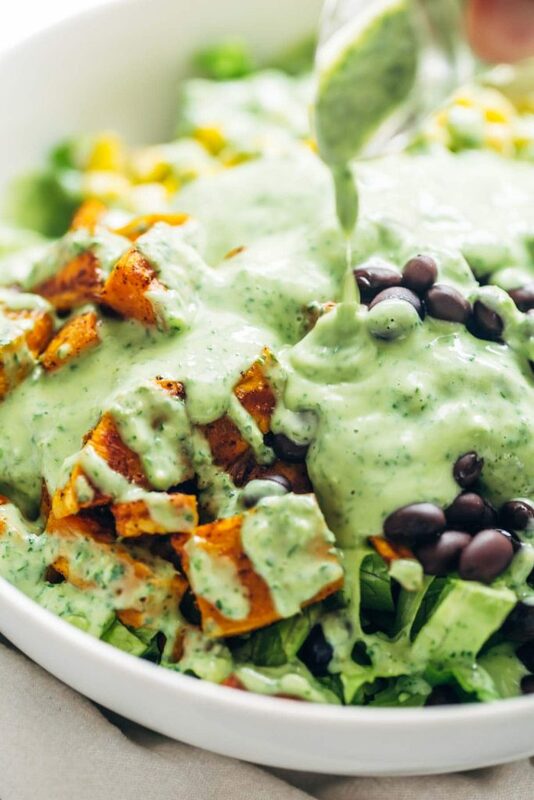 I adore this salad for many reasons, one of them being that you can actually just omit the lettuce (umm I didn’t just say that ) and toss the roasted sweet potatoes, corn, black beans, and avocado dressing together for more of a Southwestern Salad meets *Chips and Dip for Lunch* situation. Judging by how closely our food tastes align most of the time in this internet food blog space, I’m going to guess that you’ll be as obsessed as I have been for the last five hundred lunches. Insider Tip: if you are going the chip route, and if you can find chips with a spicy hit to them, you will be in spicy-cool Southwestern-flavored heaven. 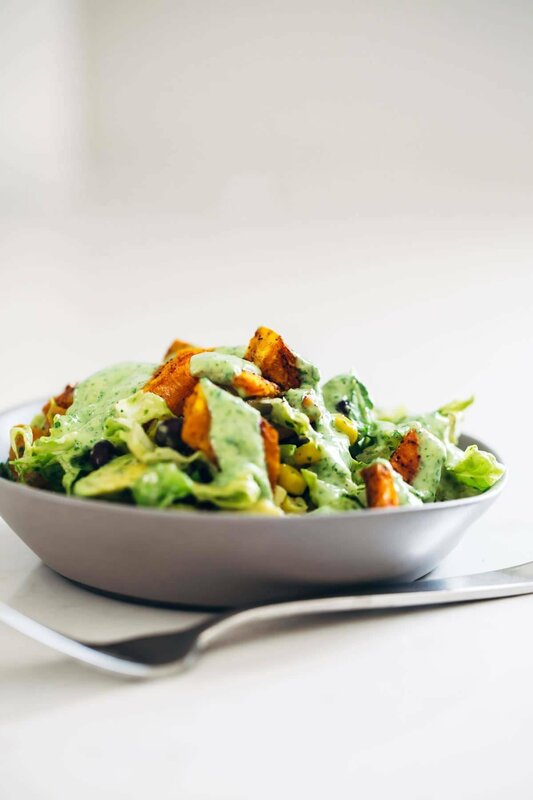 And then there’s that moment you realize that your post about a nice, real food, flavorful, healthy and whole southwestern salad has turned into a love letter to PACKAGED CHIPS. This southwestern salad takes about 30 minutes to prep, start to finish. 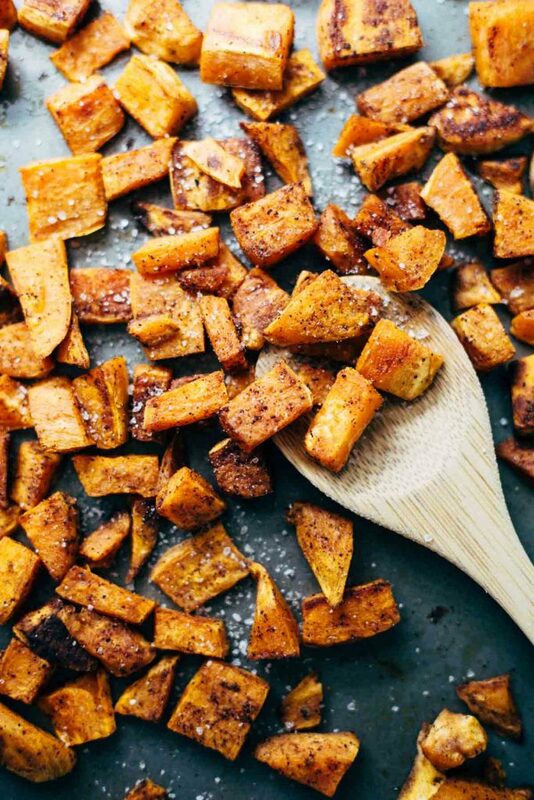 Get the sweet potatoes going, and while those bbs are doing their yummy thing with the cumin and chili in the oven, make the dressing and chop up the lettuce and drain and rinse your corn and beans. If you want to be extra deliciously awesome, I highly recommend using fresh sweet corn and grilling or roasting it. I did that one other time when I made this southwestern salad combo happen and it was D to the Licious! On the other hand, if you’re just getting home from work and you’re hungry for dinner and you have about 2 seconds before you have to start Round 2 of more work in the evening (hiiii this is my life right now for exciting reasons that will soon be made known), then just using canned corn and beans will be right up your alley. 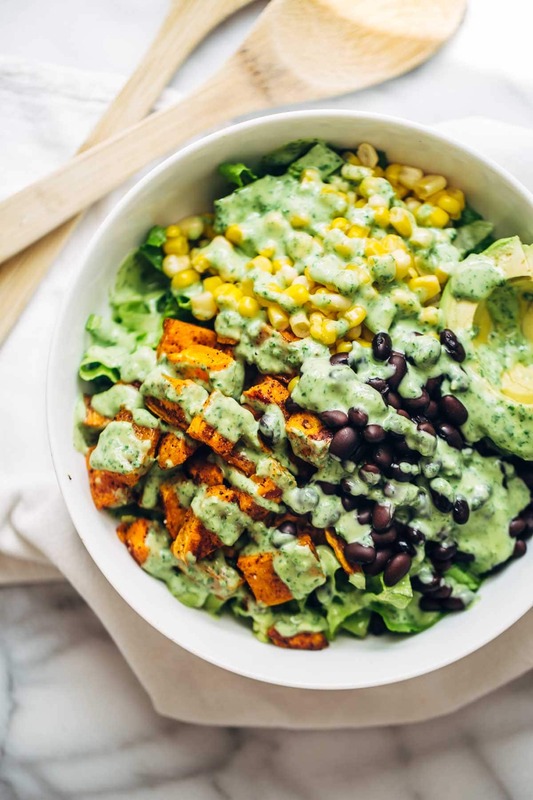 Literally right at this second I just had a vision of tossing some sizzling tequila-lime-esque shrimp in with the corn and beans and sweet potatoes, and covering it in the avocado cilantro dressing, and gobbling it all down in a moment of ultimate southwestern salad bliss. Will someone please do that for me?